Here on downthetubes we have been reviewing Cinebook's English language bandes dessinees titles for some years now, from the mature action adventure of Largo Winch, Lady S and XIII, to the child-friendly fun of Clifton, Papyrus and Yoko Tsuno. You can find a listing of the various Cinebook reviews and other Cinebook blog features here. Recently, when we can find them, we have started adding You Tube videos of the original French publishers' trailers for their releases of the various books to our reviews. While all the text and voice overs in these are invariably in French, the artwork shown in them speaks for itself. That said it is good to see that Cinebook themselves have now started a You Tube Channel featuring English language versions of these trailers for their titles which can be found here. While this venture is in its early days, the two trailers that are currently featured are for the next Blake and Mortimer release The Gondwana Shrine and the first release from the intriguing new series Darwin's Diaries, The Eye Of The Celts, both of which are due for publication this month. There are more details of Cinebook releases on their website. 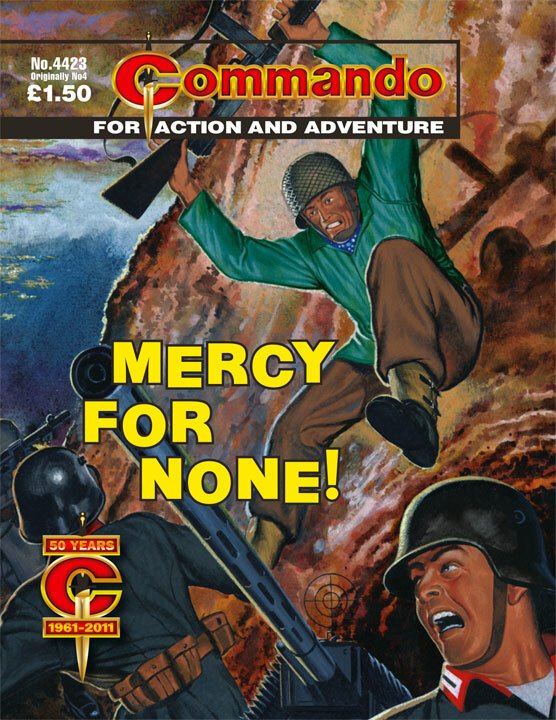 The latest issues of Commando are on sale now in all good newsagents – and there's a fine mix of stories this month, which also sees the start of the exhibition of art from the long-running comic at London's National Army Musueum. We've included a reminder about that and some special events tied in with it at the bottom of this feature. 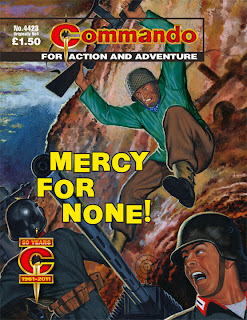 Commando 4423: Mercy for None! 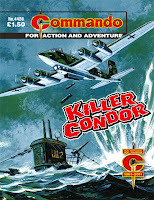 "They say that gallows humour is the darkest of all," notes by Commando Editor Calum Laird in his introduction to this reprint issue of Commando. "And this story has the blackest stripe of that type of humour running right through it. As the Paras at the centre of the action begin to meet their fates, one of their numbers starts to recite a macabre rhyme which can have only one fatal ending. "Classic Commando — you can see, and read, why they were such a runaway hit from Day One." 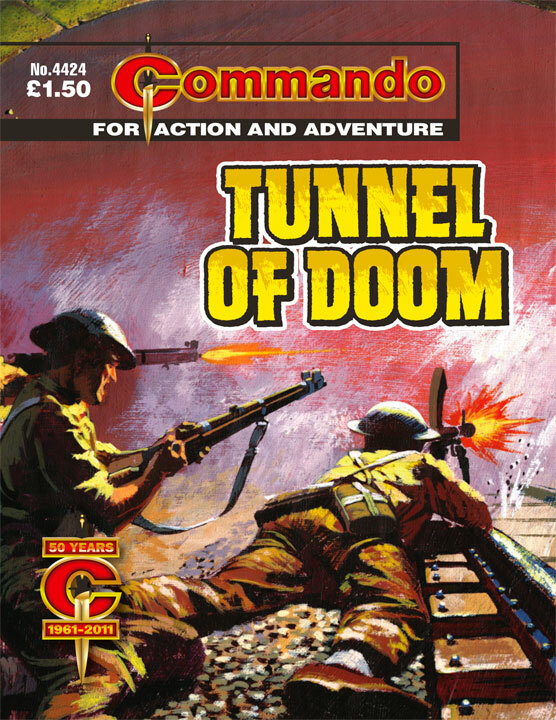 In this brilliant tale we meet a couple of ne’er’do’wells who seem to positively revel in their bad attitude and lack of discipline," notes Commando Deputy Editor Scott Montgomery. 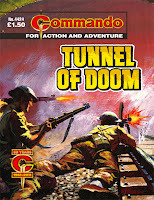 "The aptly named Dodger Harland and Scrounger Dunville are classic Commando characters and it’s not long before they’ve had a bad influence over Andy Morgan, our fledgling hero. 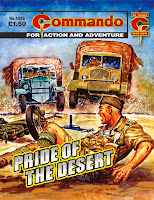 "However, when push comes to shove, perhaps these two aren’t quite what they seem…Redemption is a common Commando theme and this cracking story, with its gritty interior art and a superbly painted cover by Penalva, has an eerily original spin on it. 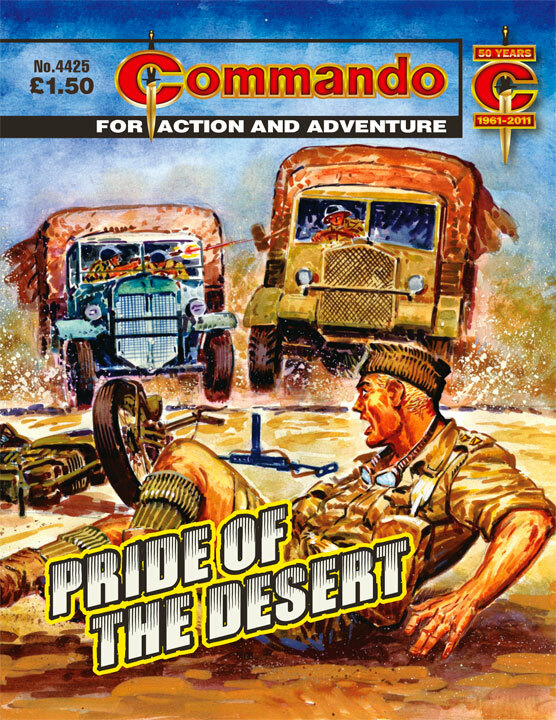 And if that’s not enough, don’t forget to add a battered but trusty Bedford QL lorry nicknamed “Queenie”…better known as the Pride of the Desert! 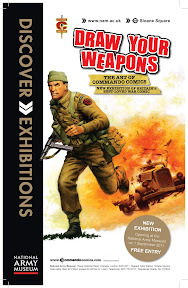 Here's a reminder of the run down of events that are part of the Draw Your Weapons exhibition featuring art from Commando at the National Army Museum in London this month. 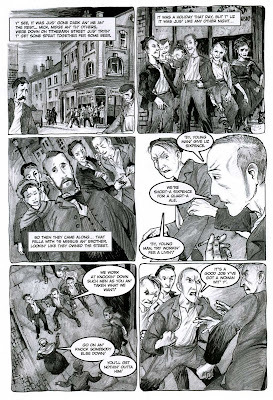 David Robertson: How did the Sixpenny Murder comic come about? John A. Short: Just as Emily (and Laurence) describe in their section of the editorial. Emily, who's a psychologist, had been using a sequence out of Mark Millar's 'Ultimates' when she was working with families involved in domestic abuse and when she came to start a programme for those involved in street crime she looked for something similar. Finding nothing ready made (like the 'Ultimates' scene) she decided to commission a piece to do a similar job. Emily worked very closely with me on the writing side of things, as she has worked with young offenders while she was with the probation system (both here and in the States) and knows their minds inside out. David: To what extent have you all been involved with comics before now? John: I have been working professionally in comics since 2003. I created the strips Rex! and Robin Hoodie for Egmont's TOXIC Magazine, as well as having scripted the Hunt Emerson created on-line comic strip Ardnox High for education websites. I have also had strips printed in America, France, Holland, Spain, Italy and Poland. Before turning professional I produced a number of self-published comics for the direct comics market both here and in the States, such as Armageddon Patrol, Loxley and the award-winning 'Octobriana' mini-series under the Revolution Comics banner. 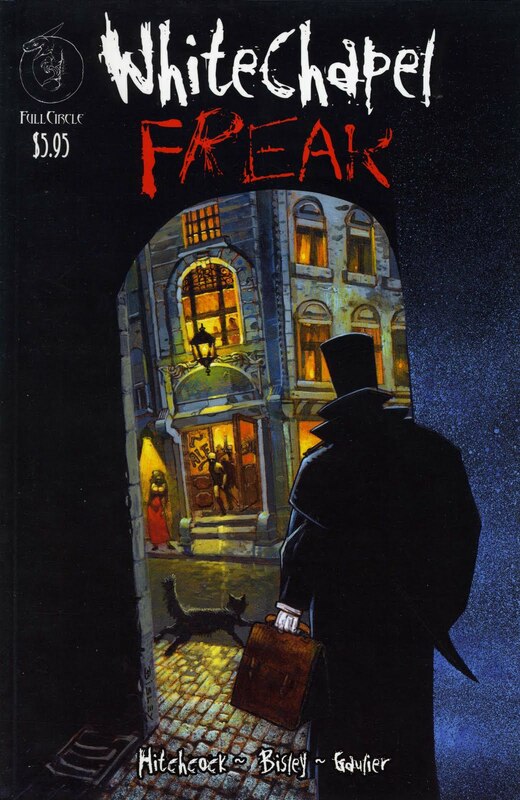 David Hitchcock has drawn (and often written) a number of critically acclaimed small press titles such as Whitechapel Freak, Springheeled Jack and more recently the [award-winning] Madam Samurai. Emily and Laurence Alison are psychologists not known for their comic work! David: What is “Changing Places +”? David: Was it always part of the plan for it to be on sale through Diamond Previews as well as being part of this social program? It exists nicely as a comic in its own right as well as being an “information booklet” for kids. John: It wasn't part of the original plan to be available to comic shops. After David completed the eight-page strip art it became clear to me that comics fans would want to see the strip too and we started to talk about making it into a little comic too. Professor Laurence Alison also liked this idea and sprung for the extra money to fund David doing a cover too. David: Have you had any word on how sales are going in the UK? John: Almost all of the first printing has sold out... Nearly 300 copies. David: That’s quite heartening actually. 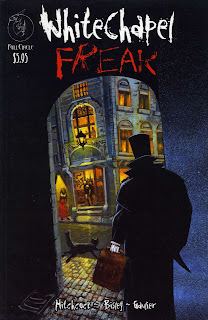 There is a market for self-published British comics, even it’s a small one. What kind of research did you do for writing the book? John: Almost all the research was done from the book 'The Gangs of Liverpool' where Emily found the story of 'The Tithebarn Street Outrage'. I think chapters one through six in the book cover the case. Apart from that all the research was done on-line for things like the geography of where the crime took place and the wider impact around it. David: What other projects are coming up for Kult Kreations? John: I set up Kult Creations to publish stuff of mine for the 'comics fan' market last year. I realised that since I had gone fully professional I had lost touch with the audience that used to read my work back in my small press/self-publishing days (1995-2004) and I had become invisible. 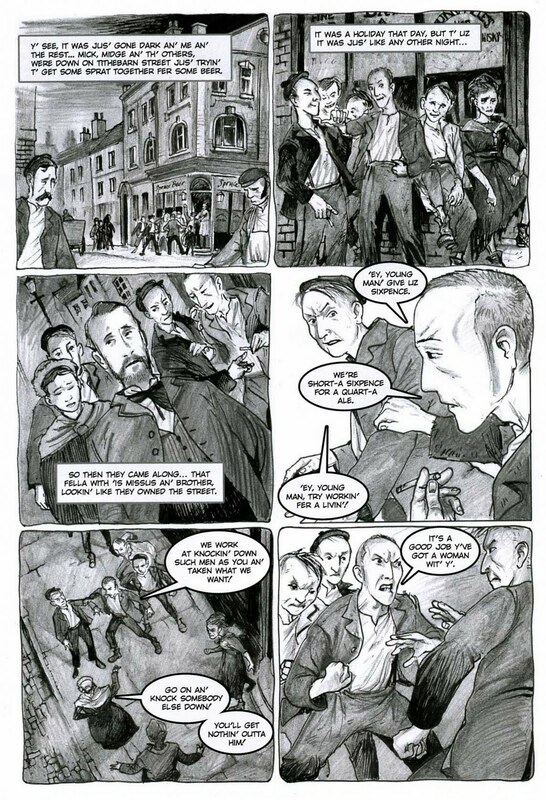 I thought things like The Sixpenny Murder and Cross (a strip that appeared in the Mammoth Book of Best New Manga Vol 2) would be of interest to editors and fans in the direct comics market, but that they weren't seeing it. So Kult Creations came into being as a way of showing comics fans what I was now up to. Obviously things like Cross and my Armageddon Patrol title might have more legs to go forward into new areas (bigger publishers, media deals and so forth) and I realised Kult Creations would be a handy way of putting those things back in front of the publics eyes. 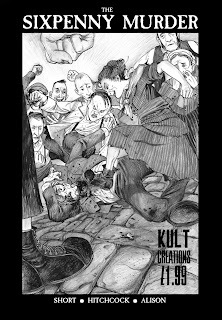 So Kult Creations isn't designed to be a big publishing house itself, but a stepping stone to more interest. David: Good luck with those ventures, John. 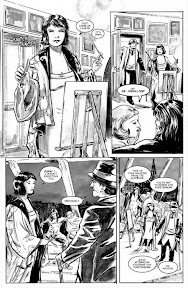 Paul Gravett is giving a talk titled "Favourite Comics from the Fabulous Fifties" at Wokingham Library, Berkshire next week (Thursday 8th September 2011). 'Comics Brainiac' and editor of the forthcoming 1001 Comics You Must Read Before You Die (which is being published by Cassell in October), Paul will take his audience through a thrilling decade that premiered Dan Dare, Asterix, Dennis the Menace, Marvelman, Astro Boy, Andy Capp and the new Green Lantern. 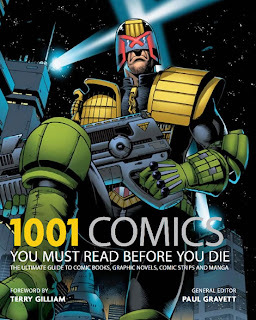 1001 Comics is described as "visually amazing" – a critical history of comic books, manga, and graphic novels and a must-have for any comic buff or collector. Over the centuries, comic books and their offshoots, such as graphic novels, manga, and bandes dessinées, have evolved into a phenomenally popular, influential, and unique art form with which we can express our opinions, our fantasies, our nightmares, and our dreams. In short: comics are emphatically no longer just for kids. This diverse, constantly evolving medium is truly coming into its own in the 21st century, from Hollywood's blockbuster adaptations of super-powered caped crusaders to the global spread of Japan's manga and its spinoffs, and from award-winning graphic novels such as Maus and Persepolis to new forms such as online webcomix. This volume is the perfect introduction to a dynamic and globally popular medium, embracing every graphic genre worldwide to assess the very best works of sequential art, graphic literature, comics, and comic strips, past and present. An international survey, this engaging volume is organized according to the year of first publication in the country of origin. An opening section acknowledges pioneering pre-1900 masterpieces, followed by sections divided by decade, creating a fascinating year-by-year chronicle of the graphic medium worldwide. The material includes the very earliest one-off albums to the latest in online comics and features some series and characters that have run for decades. Packed with fantastic reproductions of classic front covers and groundbreaking panels, this book is visually stunning as well as a trove of information--perfect for the passionate collector and casual fan alike. 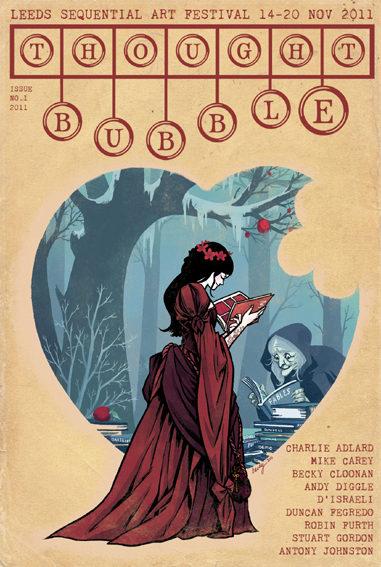 (Spotted on Broken Frontier): This year sees the Leeds Thought Bubble Festival (14th-20th November) celebrate its 5th birthday, and to mark this momentous occasion they'll be publishing the first ever Thought Bubble Comic Anthology. On sale in October, the comic will feature a variety of original tales by incredible industry talent from around the world, including Duncan Fegredo, Charlie Adlard, Andy Diggle, D’Israeli, Antony Johnston, Robin Furth, Becky Cloonan and film director Stuart Gordon. "This first anthology has been curated with the ultimate aim of showcasing the very best that sequential art has to offer," say the editors. Issue #1 will also feature all the winning entries from 2010′s Northern Sequential Art Competition with stories from Gavin Ross, Sally Jane Thompson, Will Morris, Alice Summerscales, Sophie Kamlish, and Raymond Mak. All profits from the sale of the anthology will go to the charity Barnardos. Distribution is being handled by Image Comics and the comic will retail at $2.99 (which should be around £2.20 in most UK comic and book stores). Starting a month of shows about war comics on radio show Panel Borders, Alex Fitch talks to award-winning writer Garth Ennis about his interest in the genre, from the backdrop of conflict in his debut strip Troubled Souls to his exploration of wars throughout the 20th Century and beyond in his series War Stories and Battlefields. Alex and Garth also discuss his past and forthcoming projects for Avatar, Dynamite and Marvel Comics and there are questions from the audience on the subjects of putting his stories into context for younger readers and the use of drones on the battlefield. The interview was recorded live at the Imperial War Museum, London as part of the ‘Comics and Conflicts Festival‘ last month. 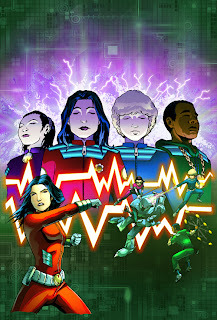 MISFITS FROM M.O.B.I.L.E., drawn by Andrew Chiu, is the first fully originated ROK Comics title and will initially be published as a weekly web comic (at www.misfitsfrommobile.com), followed by roll out on iPad and other devices. MISFITS FROM M.O.B.I.L.E. is the creation of ROK founder Jonathan Kendrick, a concept he has been developing for several years. 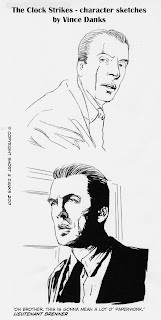 Inspired by a love of James Bond and comics, he came up with the back story for the comic, including its top secret 'MindMerge' technology and gadgets. Andrew Chiu's credits include 2000 AD, the mainstay of the British comics industry, DC Comics, Vertigo Comics and ILEX Press. Kris Carter is a digital colourist, illustrator and web designer whose credits include Transformers and Doctor Who and Jim Campbell is a professional comic-book letterer and occasional artist whose credits are far too numerous to details but suffice to say, he's worked for pretty much every major British comic publisher and some American companies, too. Further iPhone apps, working with a number of different publishers, are in development. 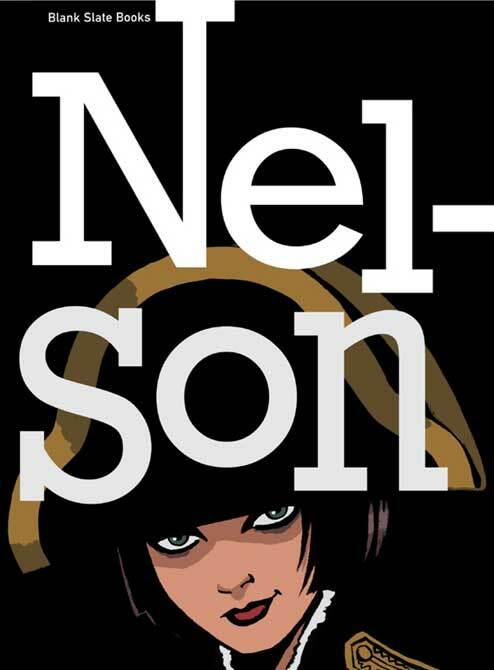 British comic creators unite for charity in "Nelson"
Time for another plug for Blank Slate's Nelson project. The publishers have just announced announce the complete line-up for the book, which a graphic novel project that will see all profits going to Shelter, the housing and homelessness charity. Seeking to celebrate the incredible diversity of talent in British comics today, Editors Rob Davis and Woodrow Phoenix have united over 50 of the UK's best and brightest comic creators for Shelter's great cause in the mother of all collaborations: a complete, 250 page story of one woman's life from her birth in 1968 to the present day. Mainstream comic sensations such as Duncan Fegredo and Sean Philips join forces with cult British creators including D'Israeli and Roger Langridge, working alongside celebrated literary comic authors like Posy Simmonds and up-and-coming alternative comics stars Luke Pearson and Jon McNaught, amongst many others. 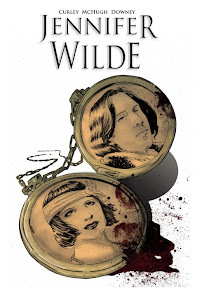 "When Rob and Woodrow came to me with their idea for Nelson, straight away it seemed to me that it should be a charity project" states Kenny Penman, Publisher at Blank Slate. "The British comic scene is more vibrant than ever before, and the opportunity to unite this diverse group of creators to aid the greatly important work that Shelter does in these difficult economic times seemed to good to miss." 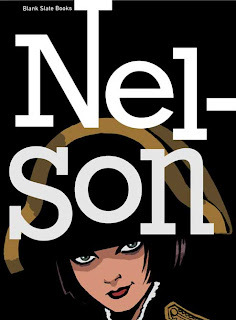 Nelson's official launch event will take place on the 22nd November 2011 at The Cartoon Museum in London, with readers able to buy a special advance copy of the book at Leeds' Thought Bubble Festival on the 19th and 20th November, where the majority of its artists will be signing copies for the public. Currently available to order in the UK section of the September edition of Diamond Previews, Nelson will be appearing in the main US section in October. • Make sure to keep up to date with future announcements via the book's Facebook page at: www.facebook.com/NelsonGraphicNovel. A module which looks at historical and contemporary comic art practices and will include visits by top British comic creators is due to commence at Duncan of Jordanstone College of Art & Design at the University of Dundee this month. The expansive module will be available to current level 3 undergraduate students studying under the Communication Design umbrella. The module will be a mixture of theoretical and practical lectures, seminars and workshops delivered in the studio and in conjunction with the School of Humanities. The module is unique in the current programmes offered in Scottish art colleges and will run for the duration of Semester 1. Top industry speakers and guests such as Cam Kennedy, Frank Quietly, Colin MacNeil and David Bishop will make visits to the College, delivering workshops and offering practical and career advice to students. The comics market is part of an ever expanding multi-million pound industry, which feeds into the games, TV and film markets, and the emerging field of Comics Studies, in which the University of Dundee is leading the way, shows students the various ways in which popular culture engages with industry and commerce. at Duncan of Jordanstone College. "You only have to look at the recent slew of Hollywood comic book adaptations to see that the comics industry can be very lucrative for a top creator," argues freelance designer and animator Phillip Vaughan, who authored the module and who lectures at Duncan of Jordanstone. "We hope to discover the next big comic book talent here in Duncan of Jordanstone!" 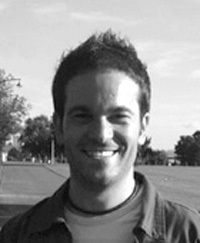 Phillip has over 15 years experience in graphic, print and interactive design, motion graphics and the 3D computer games industry and has worked on high profile licenses such as Braveheart, Star Trek, Tom and Jerry, Teletubbies, and Wallace & Gromit, subsequently working as a cut-scene producer for Farscape. He also realised a lifelong ambition and worked with the creators of Judge Dredd on a video game project for Digital Animations. The students will be tasked to produce an anthology publication in print and in a digital format, utilising their own original concepts and characters. By the end of the module students will be in possession of a creative piece of work which could form part of a portfolio. The opportunity is to open up an area of undergraduate study that is currently very much underrepresented in the UK, and to take advantage of the increasing demand for courses dealing with comics and graphic novels. The University of Dundee’s commitment to this is seen in the recent launch of the MLitt in Comic Studies by the School of Humanities, led by Dr Chris Murray. Murray, who is course leader of the postgraduate MLitt in Comics Studies is backing the module at Duncan of Jordanstone, and will assist in delivering it, just as Phillip Vaughan will assist with the delivery of the MLitt course on comics. "I'm very happy to see Duncan of Jordanstone taking on this course” he says. "It has been obvious for a while looking at the Degree Shows that students at DJCAD are very influenced by comics, so there is a clear demand for this course. “I’ve supervised dissertations on comics and graphic novels by art students at the College for several years now but it is clear that what they have been looking for has been a creative outlet and a dedicated module in this area," he continues, "so Phil’s course is a very positive development, and fits in very nicely indeed with what I’m doing at the School of Humanities. "Collaboration between Humanities and the Art College has been a very important part of making the development of Comics Studies at Dundee possible, and we have plans to pursue this further, making Dundee a focal point for comics training, teaching and research”.